This year’s Shorttrack UK meeting on the half-mile flattrack oval at Amman Valley, Ammanford, South Wales will feature a custom bike show as well as regular Shorttrack UK racing. The two-day meeting on May 29-30 it will be possible to see Europe’s best flat track racing on the super high-speed oval. 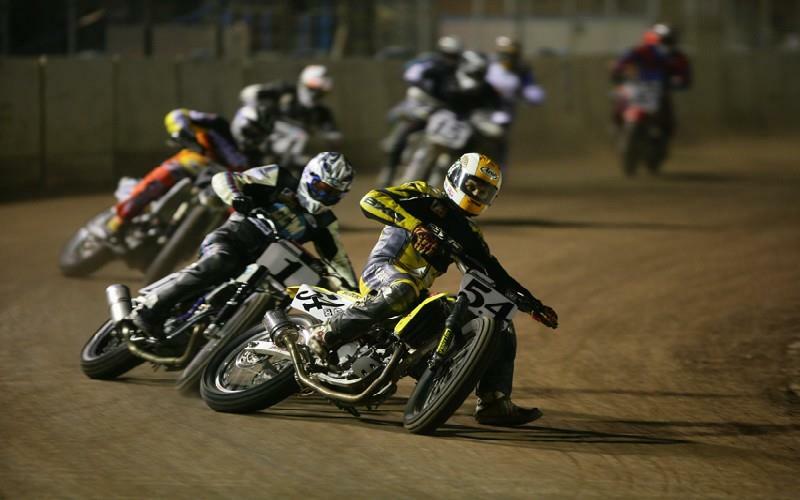 Saturday night racing commences at 7pm with the highlight being the brutal Harleys in the All-American Twin Class. Sunday racing commences at 1pm with the biggest entry ever for a European short track race competing over 20 heats. Competitors come from Switzerland, Holland, Germany, Italy, England and Wales! The custom show will see Britain’s best street trackers (converted American-style flat track race bikes for road use or specially-built road bikes based on the flat track racer look) and vintage flat track race bikes on display. Prizes for best in show, best budget bike, best engineering and best paint will be donated by Sideburn magazine and Red Max Speed Shop. An anyone turning up (on or with) a street tracker gets half-price entry.